Unless you have been living under a rock for the past couple of days I am sure you know that Jimmy Fallon took over The Tonight Show last night. What made this event so special to the Saint Rose community was the fact that he graduated from Saint Rose in 2009… you should also know that by reading this blog. 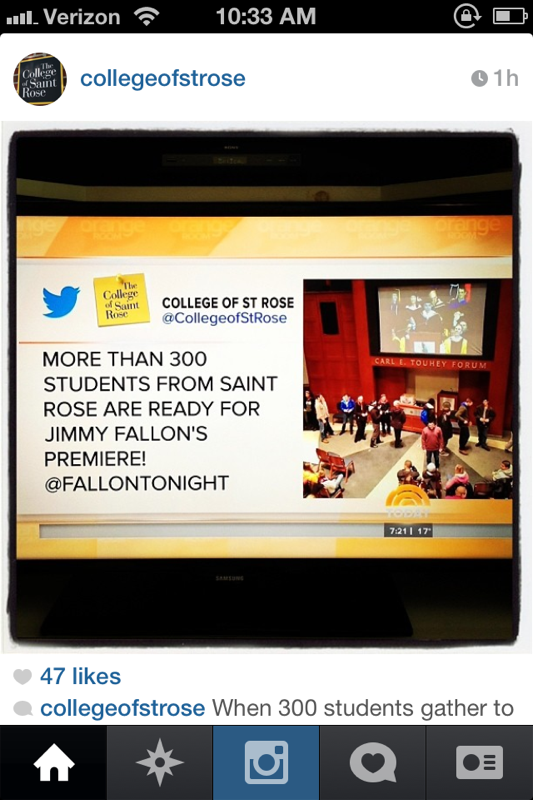 Because of this fact it was decided that a premiere party should be thrown to give the Saint Rose community a chance to watch Fallon take over and support who we feel is one of our own. As I was part of the planning committee that first thought of and then ran with the idea, I thought it would be cool to share some of the logistics and background from the high-energy showing last night. One of our tweets was featured on The Today show! When we, The College of Saint Rose Student Association and Public Relations office on campus, first started to think of things to do at the event, the first thing that popped into our minds was eating. This is because it is a well-known fact that late-night TV and eating food go hand-in-hand – especially if that food is horribly bad for you. With this in mind we ordered a ridiculous amount of cheese fries, chicken nuggets and pizza that in a college setting was gone far quicker than it should have been – even with two additional orders placed after the initial 500 nugget order. This was in part due to the fact that over 300 members of the college community came in and out over the course of the night to both watch Fallon and munch on the late night snacks. Right before the show started WNYT NewsChannel 13 went live at our event, which added to the crowd’s enthusiasm, especially as we were playing the live shot back in the viewing room. Every time the camera panned over the crowd the entire room erupted with loud cheering making it nearly impossible to hear the newscast. I found this particularly challenging as while the loud cheering was occurring I was actually the one being interviewed about what Jimmy Fallon meant to us and why the event was being put on in the first place. I can also now say that I have been “photo-bombed” on live TV, which I am pretty sure means you have made it in life. 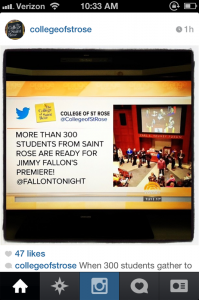 The show got underway right after the lively newscast as students, staff, and faculty alike all watched the man that left Saint Rose to achieve his own unique form of greatness. At the end of the night I am happy to say that everyone walked away from the event with a smile on their faces, junk food in their stomachs, and a sense of pride in their hearts knowing where Fallon had come from and seeing where he ended up. I really enjoyed the event last night, I thought it was a great was to celebrate our school. Do you know were we can find the video from last night news? Nice to see you on TV and to mentioned your Karnak!